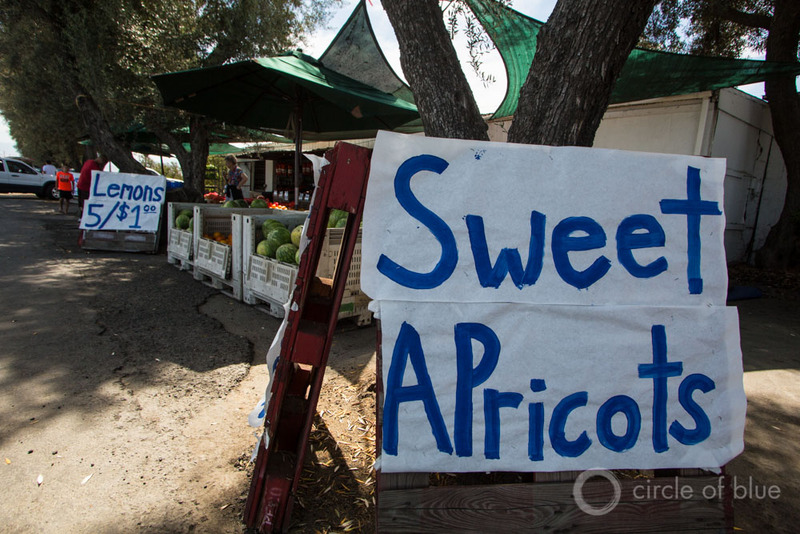 Lemons and apricots are just two of the products offered at this fruit and vegetable stand in Tulare County, California. The Golden State is the largest fruit and vegetable producer in the country, but drought conditions are unlikely to have a large effect on food prices. Click image to enlarge. California stands to lose millions of dollars in crop revenue this year, the result of a fourth year of a record-breaking drought. Consumers, though, will not notice much difference in what they pay for food at the grocery store. Prices for fruits and vegetables — California’s signature food products — are forecast to rise a maximum of 3.5 percent this year, near historical averages, according to the United States Department of Agriculture. The Golden State is a farming powerhouse in the United States, producing 70 percent of the nation’s fruits and tree nuts and 55 percent of its vegetables. All told, the state’s agriculture is worth $US 43 billion to the economy annually. The industry is also the state’s largest water user, accounting for almost 80 percent of human water use each year. Nearly all of its high-value crops — fruits, tree nuts, and vegetables — are irrigated. Conventional wisdom dictates that less irrigation water means fewer crops, creating tighter supplies and higher prices. This has not happened for fruit and vegetable crops, though. This counter-intuitive outcome is largely the result of several converging factors. First, the agriculture industry in California has enough resources at its disposal to transfer water from low- to high-value crops or to afford drilling deeper wells to reach diminishing groundwater supplies. These tactics enable farmers to sustain their irrigated fruit and vegetable crops even when rivers and surface reservoirs dry up. However, if drought conditions continue, Sumner said farmers would continue taking lower value crops out of production first. “Would it be the case that you wouldn’t grow strawberries and raspberries? Boy, that’s a long way away,” he said. Second, despite its outsize influence in U.S. food production, California agriculture operates in an increasingly global marketplace that can account for any supply gaps that occur. Lastly, retail prices for food are heavily influenced by processing, packaging, transportation, and labor costs, as well as exchange rates — not just the base price of the product sold by farmers. Farmers received no irrigation water last year from the federal Central Valley Project, and they will not receive any this year either due to drought conditions. The project delivers surface water to more than 1.2 million hectares (3 million acres) of farmland. The most significant reason crop production is not declining across the board, however, is an increasing reliance on groundwater, especially in California’s coastal farming regions. Researchers from UC Davis predicted last July that farmers would use as much as 6.3 billion cubic meters (5.1 million acre-feet) of groundwater to make up a surface water deficit of 8.1 billion cubic meters (6.6 million acre-feet) in 2014, bringing groundwater’s share of agricultural water supply to 53 percent from 31 percent. “Groundwater availability and use is the key to agricultural prosperity in the 2014 drought and future droughts,” the UC Davis report said last July. The report also found that farmers fallowed 166,000 hectares (410,000 acres) in the Central Valley and 7,700 hectares (19,000 acres) in coastal and southern California farm regions last year in response to scarce water supplies. Most of these fallowed acres were land that was used for lower-value crops, such as animal feed. Farmers in California are shifting scarce water supplies to irrigate high-value crops like fruits and vegetables, mitigating the drought’s effect on these items. Click image to enlarge. Most are choosing to transfer their water resources to fruits and vegetables. Transfers are particularly necessary in the Central Valley region, where groundwater supplies have plummeted and it is no longer economically feasible for some farmers to drill deeper wells. Policy changes that more clearly define who owns what water — including groundwater — and when that water can be stored, withdrawn, or sold to another user could further facilitate water transfers to the most valuable crops, Sumner added. If the drought persists for several more years and groundwater becomes as scarce as surface water, U.S. consumers might be buffered from price increases by shifting production to wetter states and countries. Commercial farms in these other regions, moreover, are often owned by the same companies that operate in California, according to Fink-Weber. Most fresh fruit and vegetable imports to the United States come from Chile and Mexico and include many of the products that California produces such as avocados, strawberries, and tangerines. “Even though California and other states produce a lot of fruits and vegetables, the U.S. is actually a net importer of fresh fruit,” said David Levin, an economist at the USDA Economic Research Service, in an interview with Circle of Blue. Currently, the strong value of the American dollar is making imports relatively less expensive, exerting downward pressure on food prices. Relatively low fuel prices are also helping to keep food prices down, because it costs less to transport agricultural products to market. The drought does have the potential to drive up food prices for the state’s agricultural products, depending on its duration and severity, but these other factors serve to exacerbate or mitigate those effects, Levin added.